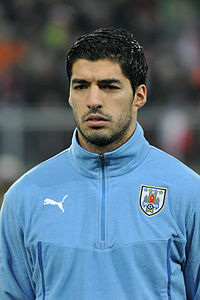 Luis Alberto Suarez Diaz (born 24 January 1987 in Salto) is an Uruguayan footballer. He plays for FC Barcelona and the Uruguay national team as a Striker. In his home country of Uruguay, he is considered to be one of the biggest ever talents of the country. The transfer between Nacional and FC Groningen, which cost 1.5 million Euros, was the biggest purchase ever in the teams' history from the Groningen province. Suarez is known as one of the best strikers in the world. He used to sell tickets at bus stop and then used to go for his football coaching classes. His brother Paulo Suárez is also a professional footballer. ↑ "2014 FIFA World Cup Brazi: List of Players: Uruguay" (PDF). FIFA. 14 July 2014. p. 31. Retrieved 22 March 2016. ↑ "Luis Suárez Bio, Stats, News -Football/Soccer". ESPN. Retrieved 2 February 2013. This page was last changed on 22 August 2018, at 10:53.